The big news this week comes out of North Carolina, where cooperation with ICE in detaining immigrants played a big role in the defeat of three incumbent sheriffs. The sheriffs were defeated in the counties hosting Asheville, Charlotte, and Durham. "I thank my immigrant community, my Latino community," Clarence Birkhead, the incoming sheriff for Durham told supporters on Tuesday. "We have to do everything we can possibly do to keep our families together [and] not cooperate with ICE." The Sheriffs had all participated in various cooperation jailing programs with ICE, such as 287(g) and Secure Communities. These initiatives are data sharing programs in place since September 11th that automatically report biometric arrest data from local law enforcement to federal agencies, mainly ICE. ICE cross-checks this data with multiple databases andare able to identify cases in which an immigrant's legal status is not confirmed. If there's reason to believe a person might be undocumented, ICE can easily assume custody directly from local county jails by asking county jails to honor their detainer requests. In Charlotte-area Mecklenburg County, African American police officer Gary McFadden defeated incumbent Sheriff Irwin Carmichael by a margin of 20%. The win was the result of years of organizing by immigrant rights activists in the Charlotte area. On February 16, 2017, organizers with Comunidad Colectiva and other organizations organized a massive 8,000 person a Day Without Immigrant march. Over 86 businesses shut down in solidarity with the march. "We had people drive in construction vans, who decided not to go to work, but instead the march - it was incredible"
Organizers began to examine the 287g program and decided that with an upcoming Sheriff's election that they could funnel that energy into defeating the program. Stefani Arteaga began live streaming steering committees of the 287g coordination meetings and members of the community were shocked by what they saw. Many activists began to show up to the publicly held steering committee to demand answers about how and why immigrants were being detained and deported with the cooperation of local law enforcement in the Charlotte area. Organizers were able to form crucial ties with the black community after the Mecklenburg County Sheriff instituted a program, where loved ones could only speak to the incarcerated by paying to speak to them through a Skype-like computer system. Additionally, organizers worked closely with Charlotte's large Southeast Asian community, who have been mobilizing against police brutality in their communities. While on the campaign trail, African American sheriff candidate Gary McFadden frequently linked the struggles of immigrants rights and African American communities problems with the prison system. "I think what we are seeing is a coalition of black and brown folks that understand the intersectionality of our common issues of the mass incarceration system and how it affects a different community and how black and brown bodies are profited off of," says Artega. "We had so much intersectionality and respect and support for each other that is really what helped this campaign so much," says Artega. For a variety of legal reasons, withdrawing completely from jailing programs instituted for national security purposes like 287(g) and Secure Communities established and mandated by the federal government is not fully possible. Mandatory security measures in place automatically report county-level data to ICE and the Department of Homeland Security. However, sheriffs do hold an important administrative power on whether to comply with ICE's detainer requests and hold immigrants until ICE arrives. 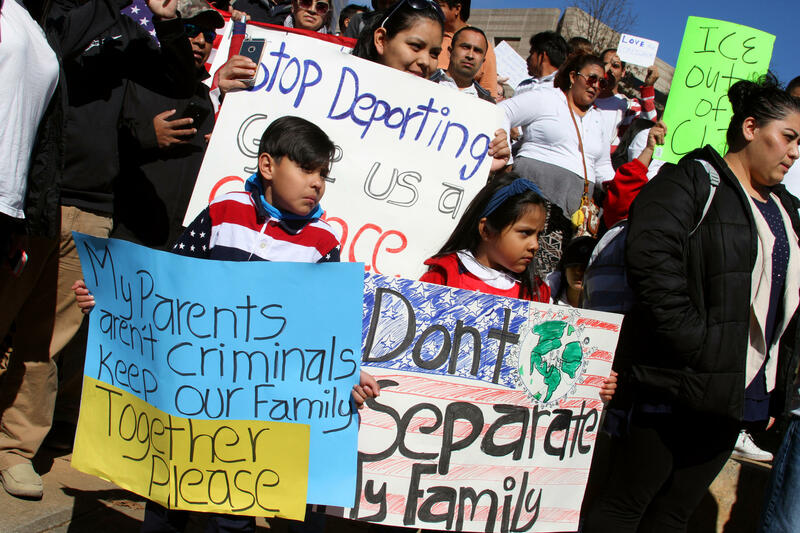 Certain county jurisdictions have deviated from the tone of the Trump administration by not holding immigrants longer and facilitating a direct transfer of custody. Less than 10% of immigrants are able to secure legal representation once in detention, and having a lawyer plays a significant role in the outcome of deportation proceedings. Most immigrants end up representing themselves with far worse outcomes than if they had lawyers able to navigate the system. Additional concern remains among activists that ICE may take retaliatory action against the local community for failing to fully cooperate. "ICE has come out with statements saying if 287g is removed that they are going to increase ICE activity," says Stefani Artega an immigrant rights activists with Comunidad Colectiva. Still, the new sheriff could use the opportunity to use local administrative discretion to protect immigrants rather than immediately jailing them and empowering ICE is a victory and a step in the right direction towards the Latino community. From Monday to Wednesday, 24,000 medical and service workers with AFSCME Local 3299 were on strike at the University of California. Over the final two days, 29,000 nurses and medical technicians from other unions joined them in solidarity. AFSCME Local 3299 demanded a six-percent yearly raise, a freeze on healthcare premiums and an end to the outsourcing of jobs for which its members are trained. "We need the University of California to stop the outsourcing of our jobs to low wage contract workers, which contributes to widening inequality for workers who are women, immigrants and people of color." Kathryn Lybarger, lead gardener at UC Berkeley and president of AFSCME Local 3299, told Payday Report. Teachers in Pueblo, Colorado have been on strike for five days, as they carry out the first teachers strike in the state in nearly a quarter-century. Instructors in the city, located about 100 miles south of Denver, called on the school district to grant them a 2-percent raise and a better benefits package. Most of the 30 schools in the district are closed, though a majority of preschools and some online courses have been reopened. "Our district has disrespected us for too long," East High School teacher Julie Cain told the Denver Post. "We are having a really hard time getting and keeping good teachers." Pueblo teachers made an average of $47,617 in the 2017-18 school year, which is 10.7 percent less than the state average of $52,728. The district has 998 teachers, and a turnover rate of over 18 percent, according to the Colorado Department of Education. The Pueblo Education Association, which represents the teachers, said on Thursday it had "made progress in negotiations" but instructors will keep "hitting the streets at and around their schools." School Board members, teachers and education advocates in Richmond, Virginia succeeded in their effort to prevent new Richmond school superintendent Jason Kamras from implementing a controversial teacher evaluation system. The evaluation method, which Kamras developed in Washington, D.C., directly tied teacher effectiveness to student achievement. It has been linked to a pattern of corner-cutting among teachers in Washington's public schools, according to an investigation that found 1 in 3 graduates in 2017 had not met requirements. "It created a culture of fear," David Tansey, a high school math teacher in Washington, told the Richmond Times-Dispatch. "Because it was paired with a top-down culture of getting results quickly, it became abused." Kamras, the highest paid superintendent to serve in the district, said student achievement should not factor as centrally in teacher evaluation as he once believed. "My thinking on this has evolved," Kamras reportedly told a crowd at the Richmond Police Training Academy. "I was much more student learning as, sort of, everything, and I still think it's important, but I've evolved to a place where there are a lot of other things to consider when you're talking about teacher evaluation." Teachers in Tucson, the largest school district in Arizona, will not receive the 9 percent raise guaranteed by the governor and allocated in a law passed earlier this month. The law allows each individual district to decide whether additional school funding will, in fact, go to teacher raises. Gabriel Trujillo, the superintendent of the Tucson Unified School District, said he will provide the money to al school support staff, not just teachers. "I see us supporting the educators as defined by this movement, those that are touching the lives of kids and working directly with kids. It's about the monitors, it's about teachers, it's about the counselors, it's about the custodians, it's about the secretaries at our schools, it's about the office assistants," Trujillo told the Arizona Daily Star. Jason Freed, president of the Tucson Education Association, said he agreed with Trujillo's approach, and called 9 percent raise for teachers a "fallacy that the governor is pushing." An anti-tax organization in Oklahoma filed paperwork last week to put a referendum on the November ballot that would veto the new taxes passed this year to fund teacher pay raises. The group, Oklahoma Taxpayers Unite, needs to collect about 41,000 signatures by July 18 according to local NBC affiliate KFOR. For more, go to local NBC affiliate KFOR. -- Last May, Payday was the only outlet to cover the tragic electrocution death of Sergio Gutierrez on a construction site. The reporting went viral in the Nashville and our ensuing series helped start a broader conversation. The death of Alfonso Dominguez, who fell off the roof of a North Nashville home under construction, shows how some construction companies can evade liability for accidents, especially in a booming city like Nashville. A labor shortage has led to a fracturing of work sites, where subcontractors can't complete projects with their normal crews, so they hire small "subs of subs" below them. Workers at the bottom are sent onto scaffolding and roofs without safety equipment or training, or the assurance their families will be taken care of if they fall. Dominguez was one of 16 construction workers who died in the Nashville metropolitan area during 2016 and 2017 — the deadliest two-year stretch in more than three decades, according to a Tennessean analysis of state and federal OSHA data. More workers died in Nashville in 2016 than in Austin, Texas; Orlando, Florida; Memphis; and other areas with rapid growth or a similarly sized workforce, according to the most recent Bureau of Labor Statistics figures. Go to the Tennessean to read the full story. "A Department of Labor investigation found that the company had failed to pay hundreds of thousands of dollars in wages and that workers pulled 18-hour days. Drivers are so overtaxed that they hire additional helpers — often young men off the street — to try and complete their routes on time,". Go to ProPublica to read the whole story. -- Finally, Obama Deputy OSHA Director Jordan Barab writing at his newsletter Confined Spaces has a deep dive looking at Trump's spring regulatory agenda to rollback the regulatory agenda at OSHA. The bad news, of course, is that the most significant regulatory movement by OSHA continues to be in reverse with a proposal undermining beryllium protections for construction and maritime workers, delay in full implementation of the beryllium standard for general industry employees and a proposal to roll back some provisions of the electronic record keeping standard, which OSHA is predicting for sometime in July. The National Employment Law Project also points out DOL backsliding in protection of young workers, action at the Department of Agriculture weakening protections for meat processing workers and EPA's actions that could result in more worker exposure to toxic pesticides. It's Payday, so if folks can pass the hat to help us get down to North Carolina that would be great.